I’m loving the longer days. The early evening sun that means that I can pop outside when the girls are in bed. Collect the washing off the line. 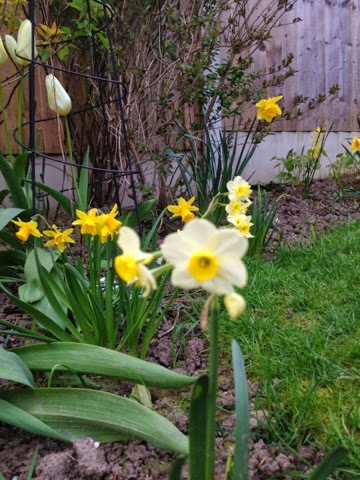 Take a quick look around the garden whilst the pasta cooks. Make plans to dig, sow and plant. Plans are afoot, decisions have been made and things move onwards. I’ve had some leave approved for June. We find out about schools next week (eek), my parents are up for another visit and I shall be enjoying an ’extra’ day off after the bank holiday as the university still has a closure on some Tuesdays after bank holidays. So here’s some more of my 101 days countdown. :: Bringing home LittleR’s nursery profile book to look at all the things she’s been up to whilst we’ve been at work. :: Asking where’s LittleR gone and looking round and seeing she’s up the stairs! This little girl has no fear!! I’m sure she was a mountaineer in a previous life with the amount of climbing she does!! :: Seeing BigR and LittleR enjoy the (surprisingly and gratifyingly quiet) soft play centre. Last time we went LittleR couldn’t walk and BigR didn’t have the upper arm strength to use the monkey bars. :: My parents arrive for a weekend visit, and take BigR to their place (a little holiday home) for a ‘sleepover’. :: A delicious family meal out. 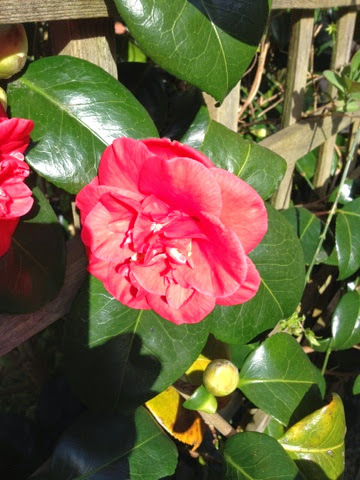 :: The camellia finally in flower. :: Taking both Rs swimming. LittleR hasn’t been swimming before and she was a little nonplussed about the other people in her, slightly colder than usual, bath! She got the hang of it eventually and splashed away whilst clinging to me or the ABO. :: Giving the ABO 45 minutes of quiet during the football but taking BigR away to do some baking the result being a very delicious apple cake. 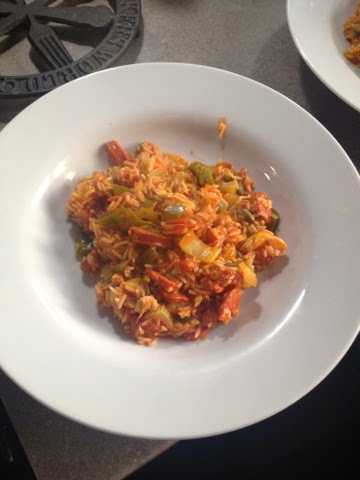 :: Making (and eating) jambalaya….haven’t made this meal in a while and it really is delicious. I used to make this with Cajun spice but here was always something not quite right about it. Anyway my discovery of Bart’s Creole spice made it, in my mind, a more authentic taste. It’s very easy and quick. 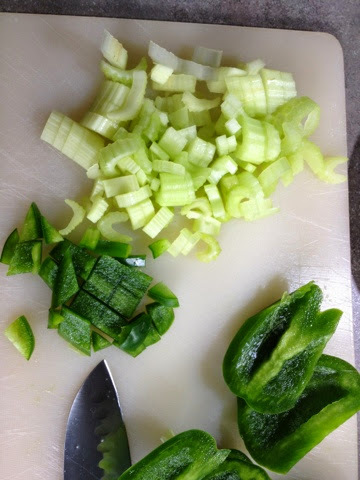 On this day I didn’t have anything other than green peppers so it is overwhelmingly green. I knew we were hungry and this made 3 meals (one for the freezer) with seconds for the ABO and myself. I browned chopped chicken breast (2) and half a chorizo sausage together for 10 mins then removed to a plate. 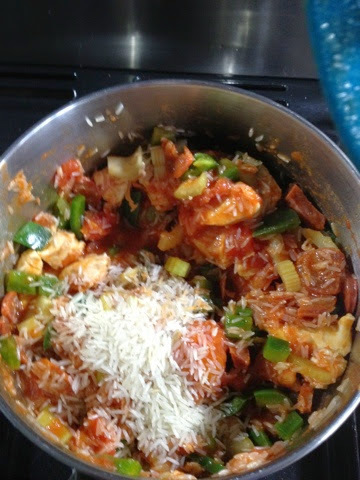 In the chicken/chorizo pan I fried off 3 sticks of celery and 2 green peppers, after 5 mins I returned the meat to the pan add 2-3 teaspoons of creole spice, a big tin of tomatoes, rice and 400ml of chicken stock. Stirring well until brought the boil, this is turned down to a simmer for about 20 mins…or until the rice is cooked and the liquid has been absorbed. Sometimes, I need to add a bit more liquid depending on the type of rice I have used and how much I’ve thrown in. :: Meeting the ABO for lunch before he collected the girls. 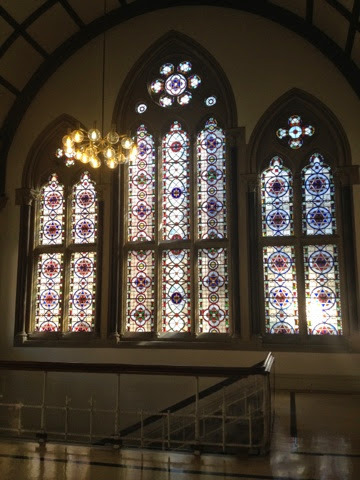 :: The light through a stained glass window in the Leeds General Infirmary. 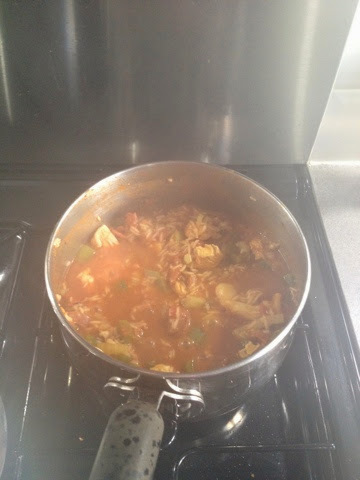 Your jambalaya looks delicious. I enjoy reading this list when you post them, they're always interesting and thought-provoking. Thank you...we did have lots of fun! :-) Hope you did too. We did enjoy it. Hope you enjoyed the lemon pasta it's on my radar again as the ABO is on lates! !